It's a true family affair at Aurora Home Hardware Building Centre, a pretty town in horse country north of Toronto. With his down-to-earth approach to life, Stuart Barfitt doesn't fit the idea of a typical Aurora resident, but the area was much different when he first arrived from Newfoundland in 1948. He worked for Canada Packers for 18 years then got into the hardware business when he bought a small hardware store in town. 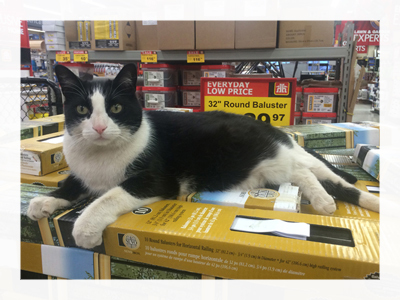 He joined Home Hardware in 1969 after a visit from the local Area Manager Jeff Lee and a quick trip to St. Jacobs convinced him it was the right move. Stuart has been retired for 20 years, although he still builds picnic tables, in one of the many garages on his son Randy's property, that are sold in the store. He had just finished 22 of them on the rainy, cool day in June when I first visited him and two of his three sons at the store. Stuart has building in his blood - on which subject, more shortly. His three sons, Russ, Randy and Robert, and their respective wives, now own and run the business, with 70 employees including a plethora of third generation Barfitts - Robbie and Carlie (Randy's two kids), John (Russ) and Calvin (Robert). The business has had three locations over the years: the original 2,000 square foot store on Yonge Street, then a somewhat larger location at Yonge and Wellington that they moved to in 1974 and their current 25,000 square foot store on Wellington Street East which was a farmer's field in 1986 when Stuart and his late wife Doreen bought the property. 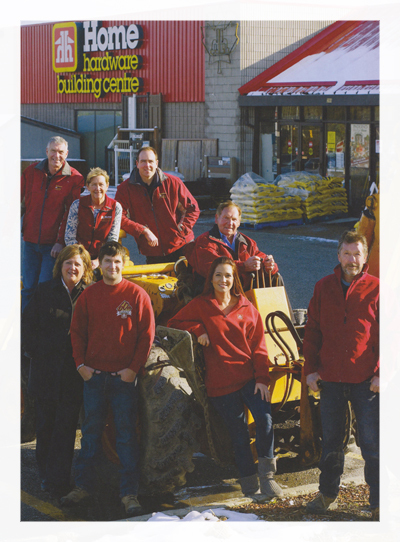 The family built the store from the ground up - literally. Doing virtually everything themselves with a little help from their friends. They levelled and compacted the ground, using an old back hoe that is a relic from another era, trucking in fill—at one point there were 20 trucks pulling 100 tons of fill up Yonge Street. They installed their own water system. Randy did all the welding and at one point Stuart remembers, even their Home Hardware rep pitched in - he turned up one day when they were working on the asphalt and someone handed him a pair of rubber boots. The entire project took about 10 months, and they worked through "probably the worst fall" ever, Stuart remembers, often having to push the backhoe through the muck. They kept the old store open and running throughout the building process, moving out the inventory in stages. One week they closed the old store on Saturday night and the next week they opened the new store on Monday morning. "Never missed a day," Randy says proudly. The community has changed over the years, from a small town where they knew everyone who came through the door, to an upscale and growing neighbourhood of chic restaurants and smart shops. Like Stuart, the 25,000 square foot store takes a no-frills approach, a bit out of keeping with the genteel feel of the town, but not surprising given that the majority of their business is contractor-based. Stuart never actually worked in the current building, preferring to build a house a year, and occasionally working at night creating store displays. When they were kids, the boys worked in the store every day after school, learning the business. Today the three sons have divided the responsibilities in a way that works for everyone, keeping all the Barfitts busy and readying the third generation for the day when they take the business over, still a few years down the road. Stuart and his boys reminisce about the early days in the original store. They still have the first dollar bill the business earned, to remind them of their start. The Barfitts have been part of a process of change that, in relatively few years, has taken them from a small, old fashioned hardware store where every bill was written and added up by hand, where they did not even bother with a cash register, to a large HHBC with a lot of sophisticated systems. They built the business, with their own physical labour and hard work year after year, so the sense of family values is strong even after all the years, all the changes and all the growth. When it comes to the important stuff, some things never change. Stuart and his wife Doreen went on several of Walter's study trips: Stuart remembers that Doreen and Jean, Walter's wife, got along famously, even getting into trouble together when Jean blew the bus horn in a town that had strict bylaws against doing that very thing. They got on the road in a hurry that day! The black and white cat is Cloak. Cloak has been a resident of the store for many years. As of March 2016 he has been retired to the home of an employee. 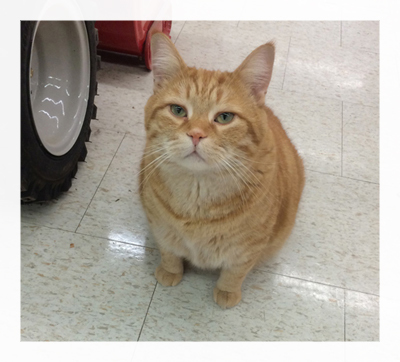 The orange cat is the new store cat Tigger aka Garfield. Who was adopted in 2016 as Cloaks replacement.